It was a bloody awful 24 hours since that excellent meal at Toups’ Meatery. Slept badly, woke up way early. There was confusion with no cabs downstairs, and finally got one. All okay at airport with bag drop and security (I think too many stupid people are getting TSA PreCheck tho, it’s getting slower thanks to idiots not understanding how it works…), but a ground stop thanks to weather in Atlanta. I chilled out in my “usual” corner seat and enjoyed a cocktail and chatting with some staff. They do have some of the friendliest staff in the country, and the bartenders are top rate. It’s seriously worth it to run out to Macon for food here at Dovetail. Even the drinks are worth it. I enjoyed another cocktail from the excellent bartenders when the first item appeared, the shrimp and grits. Very nice, spicy and strong. Worked perfectly with the paired cocktail, which had a wonderful smokey feel. The shrimp were meaty and flavourful, the corn adding a nice sweet dimension to it. 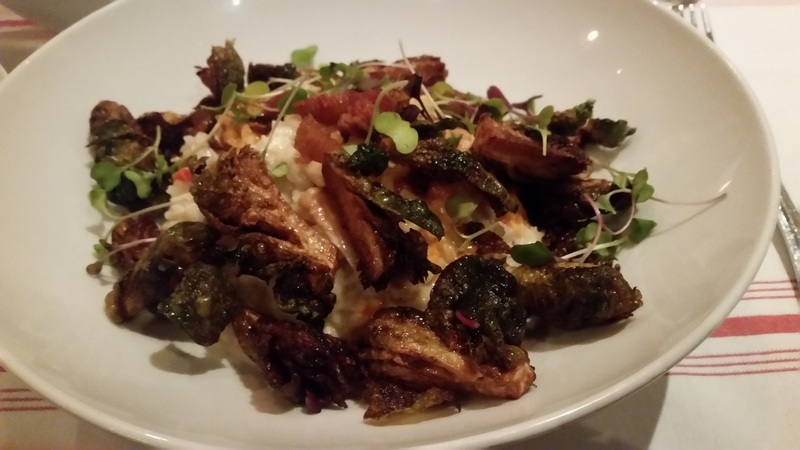 The spicy sauce really rocked the humble grits, which backed up the dish perfectly. When we still had my beloved Elettaria I always hated eating at my own bar when it got like that. Odd feeling. Diners don’t like folks reaching over them to get drinks; drinkers don’t like a diner hogging the bar space. It’s never a happy coexistance. So I made my leave. I don’t blame this place for being busy, which is great for them, but for me it just didn’t allow me to chill. So time to go. I think next time I come I will take a cab and come on a Tuesday or something…and yes, I will be back. Macon’s way out of the way for me, but the food, drinks, and wonderful staff will get me to take these hour-long detours any time I am in Atlanta. 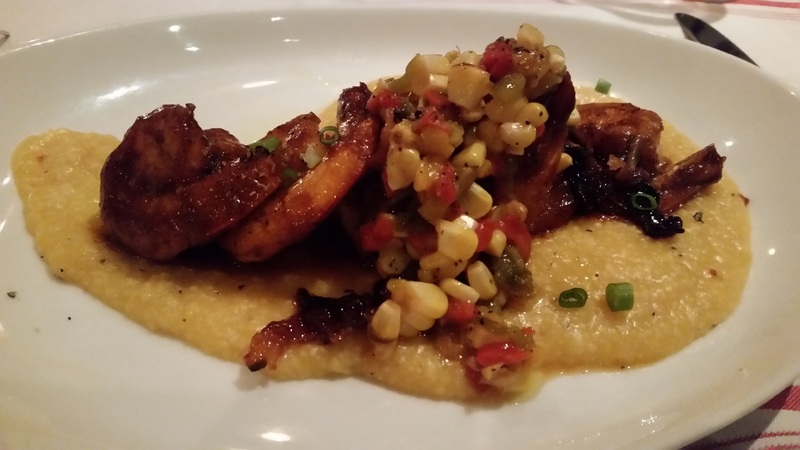 This entry was posted in Food..., Restaurant Review, Travel and tagged Macon by mel91872. Bookmark the permalink.